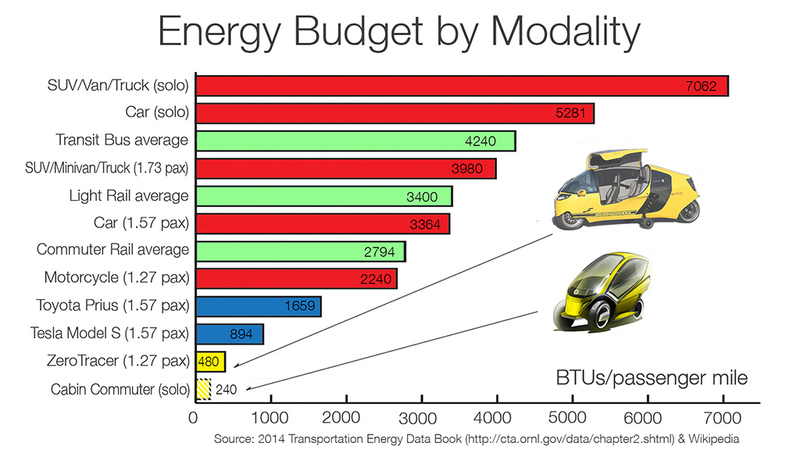 The graph shows the amount of energy required to move a human body around by various modalities, expressed in BTUs/passenger mile. This efficiency measurement is environmentally relevant, but the real reason I’m sharing this information is because it directly reflects the true cost to the end consumer of each option, absent of subsidies. That BTU measurement might as well be dollar signs. In fact, let’s convert it to dollars and cents. This is the exact same graph but with BTUs converted to dollars, expressed in cents/passenger mile. Everything in red is a traditional gasoline powered automotive product. I should caveat that the top two entries are gasoline cars and SUVs at solo occupancy because that’s the most numerically common way to commute. Everything below the top two entries are listed at national average occupancy and so are directly comparable to each other. Continuing on, the green entries are public transportation and the blue entries are prominent hybrid and electric full size vehicles. The top yellow entry is the Peraves ZeroTracer/X-Tracer, the electric Cabin Commuter vehicle that won the Progressive Automotive X-prize in 2010. Don’t forget, however, that that vehicle was an electrically retrofitted, 35 year old gasoline design that’s twice as big as what we want for transporting a single passenger in a truly efficient manner. A smaller, purpose-built electric vehicle like what I described in the Cabin Commuters are the Answer section could easily cut the Peraves ZeroTracer/X-Tracer’s efficiency number in half. Taking a look at the big picture, it’s not really a surprise that the Cabin Commuter is more efficient than the full size vehicles. What is surprising about this graph is learning just how truly energy inefficient public transportation is in America. It isn’t any better than private car use. Now, if we were going to make public policy decisions based on actual energy use, then the logical conclusion to that is that the government should stop investing in legacy public transportation and invest in, and even subsidize, these small Cabin Commuter vehicles because Americans would get such greater return on their money. Now, the social progressive in me is quite uncomfortable advocating that we cease investing in public transportation, but the US Transportation Energy Data Book doesn’t lie and the underlying physics is not sympathetic to my social values. Finally, don’t forget, Cabin Commuters are point to point, which is something that public transport in its current form can never accomplish. Consequently, we can debate all day long about consumer choice and marketing and will people really accept riding in small Cabin Commuter vehicles but at the end of the day, the underlying physics, which will create the macroeconomic forces that will drive consumer choice, combined with the point to point convenience of these vehicles, all ensure that these Cabin Commuters cannot be beaten by any other mode of transportation, even public transportation.